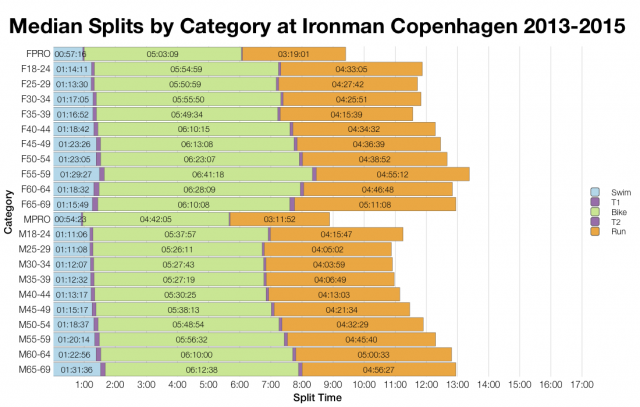 The second of the four Ironman races over the weekend was Ironman Copenhagen. Coming the day after Sweden, it shares similar attributes with that race – high entry numbers, a fast course and 40 Kona slots. This year’s event appears to trend slightly slower than the course averages, but not by very much. A slower swim, similar bike and slower run appear to be the patterns for the 2016 race. Swim times are down slightly, but run times take more of a knock. 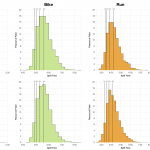 It’s enough of a change to see a rightward shift in the overall median, although the impact at the front of the age group race is less severe. There’s a small increase in this year’s DNF/DNS rates, with a particular shift in the run percentage. It would appear that run conditions may have been less favourable. 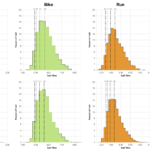 Swim percentage also changes, but I can’t say how much of that shift comes from DNS rates versus DNF rates. 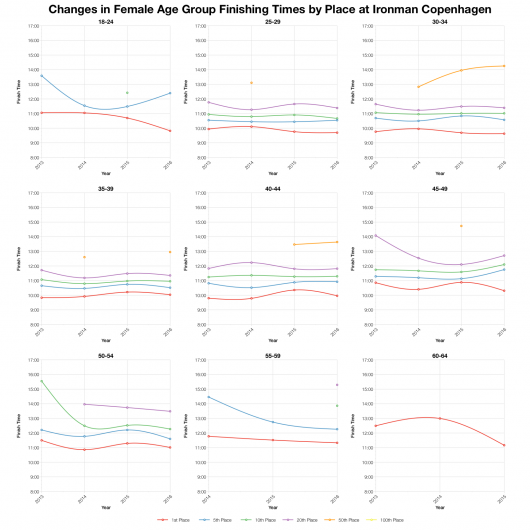 As before, the biggest difference when comparing the median splits comes on the run, where this year’s times are clearly slower. 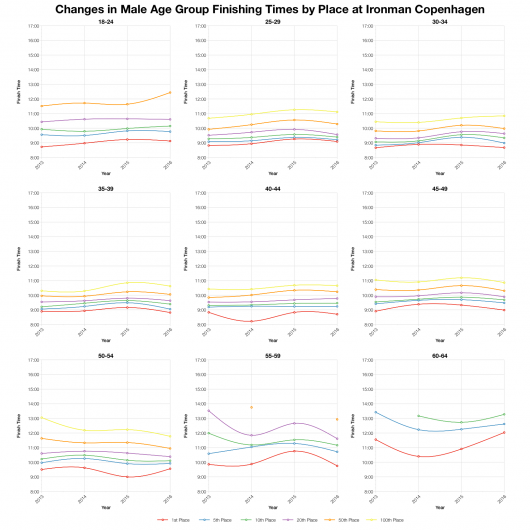 The swim also trends slightly slower, but by a less significant margin. 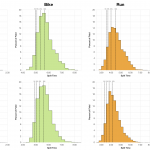 On the bike the variation isn’t as clean cut and most age groups are comparable with previous results. Unsurprisingly it’s a largely Danish contingent at this race, but like Sweden there’s a good mix of other nationalities. A lot of Brits were racing over the weekend. 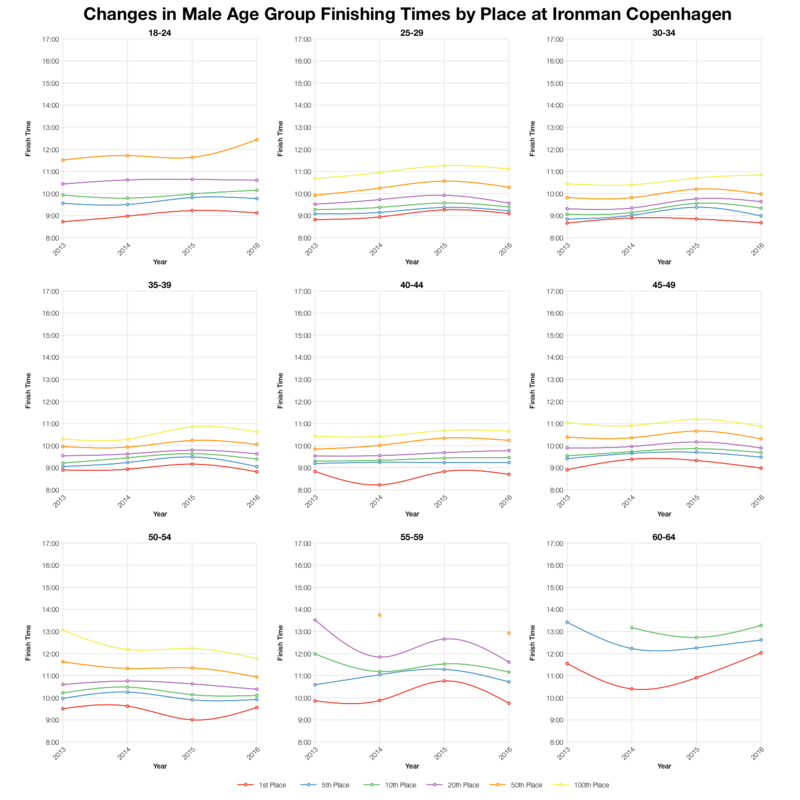 There hasn’t been a huge variation in finishing times over the four years Copenhagen has been run as an Ironman event. It’s fair to say that while the averages for this race may have come out slower it’s not by much. 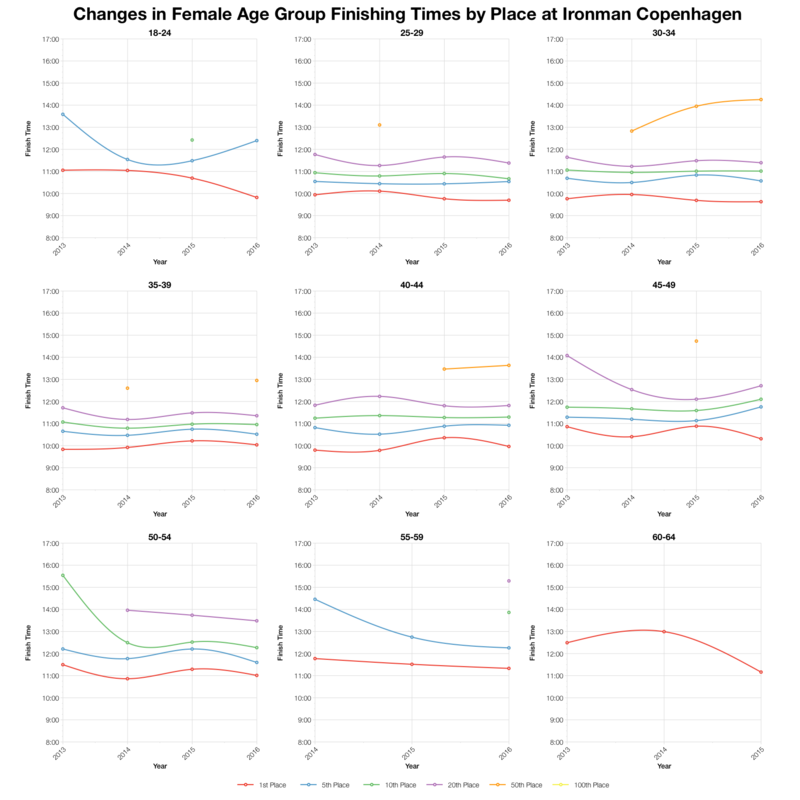 Finishing times mostly fall within range of previous year’s results. As usual I’ve calculated slot allocations based on the athlete list and from that automatic qualifying times (numbers will vary based on start numbers and roll down). Although it doesn’t quite match Sweden this is a fast qualifier. 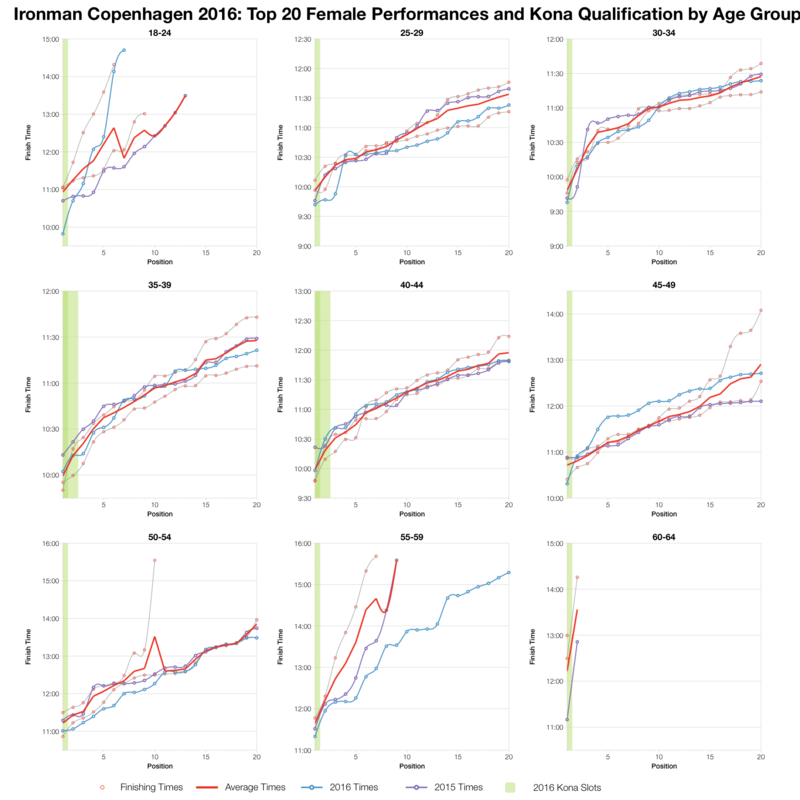 For a number of male age group you need to finish in the low 9 hours or faster and for many female age groups you’ll need to finish comfortably under 10 hours. You can compare these times with other races on my Kona qualification page. 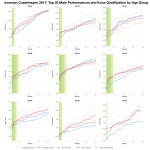 For the most part the top twenty finishers in each age group are close to the course averages. There are two notable exceptions: M30-34 and M35-39. 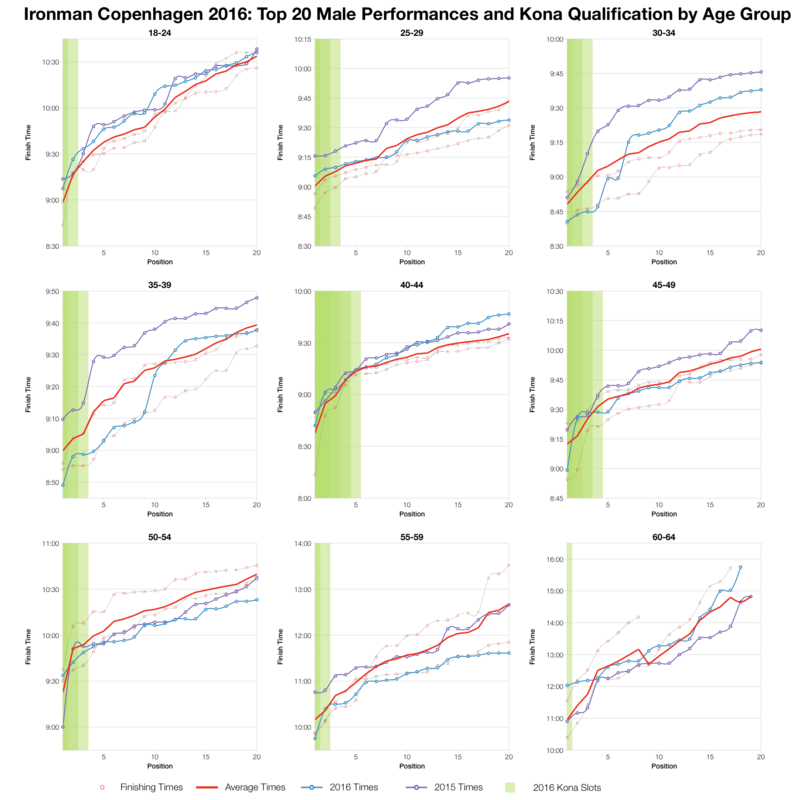 In both these age groups the top finishers, those likely to claim Kona slots, were significantly faster than average. In fact, times are close or better than the best on the course. Clearly a strong field in both those divisions at this year’s race. Overall it was business as usual in Copenhagen. Across the field times were slightly slower, but at the front of the race competition was high. 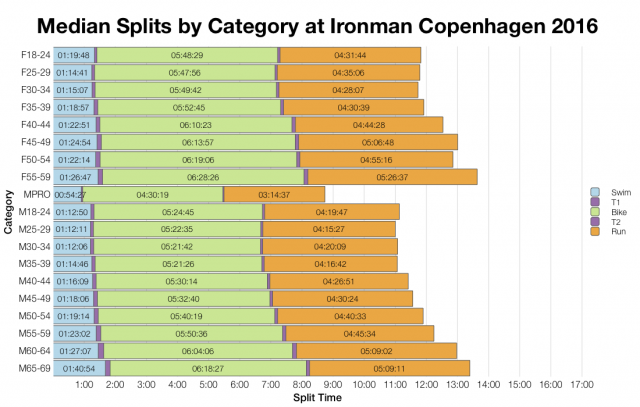 It doesn’t quite match the neighbouring Swedish race, but Copenhagen remains one of the faster European courses. You can access a spreadsheet of the full results and splits from Ironman Copenhagen 2016 on my Google Drive.